I have been pretty silent lately. I’ll be honest, there has been a major lack of inspiration for me. It’s winter in Ohio, and I have let it get to me. Thankfully, a couple weekends ago I had a beautiful weekend and I am rejuvenated. So, what sparked it? I think we all suffer from the winter blues. Balancing my work life, personal life, and this… Whoa! It’s been crazy. Yesterday I threw on my Converse, grabbed my man, and we drove down to Athens Ohio. No plan. No makeup. Something about roaming the streets of my college Alma Matter made me feel alive again. 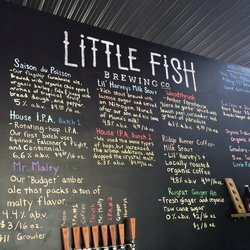 We stopped at Little Fish first. I know when people think of beer in Athens, they think Jackie O’s. And they should. But, don’t count out Little Fish. They make a killer coffee stout and some pretty tasty sours. What put the wind in my sail was House IPA #4. It was like a citrus explosion in my mouth! It was very crisp and was partnered with a reasonable ABV weighing in at 6.6%. The color was gorgeous, sunshine in a glass, a little hazy. They were rocking a cool bluegrass playlist on Spotify, paired with good conversation. We hit up another newish spot in Athens called Devil’s Kettle. The owner is a previous winner of the Ohio Brew Week Homebrewers competition. Good beer, friendly folks, but we just couldn’t stay. It was Sunday Funday at Jackie O’s Brewery. They had several bands playing and an art show going on. I had a chocolate stout (Sweet Chocolate Love to be exact) with blueberries called Kinda Blue. How was it you ask…. AMAZING! I’m a sucker for anything blueberry and you throw chocolate in the mix, heaven. It was rich and decadent with just a touch of blueberry. Normally I would say this style of beer is a one and done. Not Kinda Blue! I had two of these bad boys listening to the smooth groove of a local band called Bright at Night. Hold that… Maybe I had three. Don’t judge me, I wasn’t driving. The weather was beautiful, the beer was delicious, and the music was funky. The perfect day and way to find my mojo. Cheers!